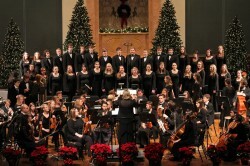 MILLIGAN COLLEGE, TN (Nov. 14, 2013) ― This year, audiences will have two opportunities to experience the beautiful sounds of the season at the annual Milligan College community Christmas concert on Dec. 7 and 8. Both performances begin at 7:30 p.m. in Milligan’s Mary B. Martin Auditorium of Seeger Memorial Chapel. Doors open at 6:45 p.m.
“Every year, we perform in front of a packed house,” said Dr. Kellie Brown, chairperson of Milligan’s music area. “We decided that it was time to add a second evening to accommodate our growing audience and ensure that we have plenty of parking and seats available for all of our guests who enjoy this annual tradition. The concerts are free, but an offering with a suggested donation of $5 will be taken. Donations collected on Saturday will benefit Milligan’s music program, while Sunday’s donations will go to the Niswonger Children’s Hospital. Posted by tommy on November 14, 2013.